Multi-link offers a variety of telephone line sharing devices that represent the very best in servicing of equipment. Because Multi-link's quality control standards are so high, Multi-link manufactures only the highest caliber telephone control products. Multi-link's goal is always to deliver quality products that you can trust. Each year the PolNet ACP saves businesses hundreds of thousands of dollars in phone line charges! The PolNet ACP series of Automatic Call Processors (ACP) eliminate dedicated phone lines by expanding the number of devices you can connect to a single line. With PolNet ACP you can gain effective connectivity for up to nine devices per line. Just think of the savings! No wonder businesses from Fortune 1000 to small proprietors rely on PolNet ACP for polling and other data exchange applications. PolNet ACP offers more than cost-effective connectivity. With added information, security and equipment protection, PolNet ACP gives you piece of mind. Engineered with programmable security access codes for each device port, PolNet ACP gives you another level of protection to keep your proprietary information safe. PolNet ACP also provides dual surge protection for added defense against transient voltage carried over the phone line. 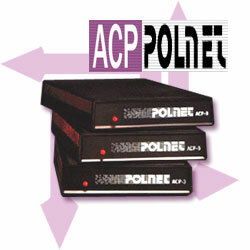 PolNet ACP is reliable and compatible. Manufactured to strict standards, PolNet ACP is compatible with virtually all telephone company phone lines, communications equipment and phone systems. Use the PolNet ACP for modems, data and credit card terminals, storage and monitor-throughput, if your equipment requires a phone line, the PolNet ACP works for you.